Keeps feet warm and toasty all night long! The Battle Creek® Deluxe BedWarmer™lets you heat your bed quickly, then switch to low heat for warmth all through the night. 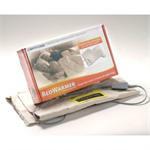 At 18" x 36", the BedWarmer is perfect for personal comfort. Lay it across the bottom of the bed to warm feet and legs, or warm just one side of the bed for personal temperature control. 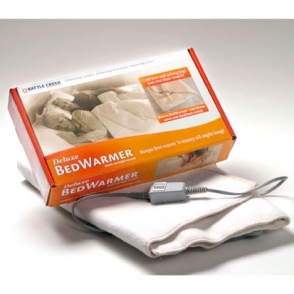 Directions: The BedWarmer™ slips under your mattress cover or sheet. Heat rises from beneath. 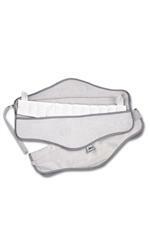 Fleece cover is machine washable at any temperature. Hang dry or machine dry on medium setting to prevent excessive dryness. Dual Use: Fits on one side of the bed or at the foot of the bed for shared use. Out of the Way Placement: Tucks underneath sheet or mattress pad. Full One Year Warranty. For the first year after original purchase, Battle Creek will repair or replace this product free of charge to the owner if it has a manufacturing defect, or if in use as described by our labels and brochures does not perform as stated.